Nephron. 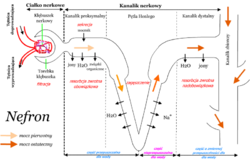 Diagram is labeled in Polish, but flow can still be identified. A nephron is the basic structural and functional unit of the kidney. Its chief function is to regulate water and soluble substances by filtering the blood, reabsorbing what is needed and excreting the rest as urine. Nephrons eliminate wastes from the body, regulate blood volume and pressure, control levels of electrolytes and metabolites, and regulate blood pH. Its functions are vital to life and are regulated by the endocrine system by hormones such as antidiuretic hormone, aldosterone, and parathyroid hormone. Composed of a glomerulus and Bowman's capsule, the renal corpuscle (or "Malphigian corpuscle") is the beginning of the nephron. It is the nephron's initial filtering component. glomerulus The glomerulus is a capillary tuft that receives its blood supply from an afferent arteriole of the renal circulation. The glomerular blood pressure provides the driving force for water and solutes to be filtered out of the blood and into the space made by Bowman's capsule. The remainder of the blood, basically the blood plasma, not filtered into the glomerulus passes into the narrower efferent arteriole. It then moves into the vasa recta, which are collecting capillaries intertwined with the convoluted tubules through the interstitial space, and which the reabsorbed substances will also enter. This then combines with efferent venules from other nephrons into the renal vein, and rejoins the main bloodstream. Bowman's capsule Bowman's capsule (also called the glomerular capsule) surrounds the glomerulus and is composed of visceral (simple squamous epithelial cells) (inner) and parietal (simple squamous epithelial cells) (outer), layers. Fluids from blood in the glomerulus are collected in the Bowman's capsule (i.e., glomerular filtrate) and further processed along the nephron to form urine. Proximal tubule The proximal tubule as a part of the nephron can be divided into an initial convoluted portion and a following straight (descending) portion. Fluid in the filtrate entering the proximal convoluted tubule is reabsorbed into the peritubular capillaries, including approximately two-thirds of the filtered salt and water and all filtered organic solutes (primarily glucose and amino acids). loop of Henle The loop of Henle (sometimes known as the nephron loop) is a U-shaped tube that consists of a descending limb and ascending limb. It begins in the cortex, receiving filtrate from the proximal convoluted tubule, extends into the medulla, and then returns to the cortex to empty into the distal convoluted tubule. Its primary role is to concentrate the salt in the interstitium, the tissue surrounding the loop. * descending limb Its descending limb is permeable to water but completely impermeable to salt, and thus only indirectly contributes to the concentration of the interstitium. As the filtrate descends deeper into the hypertonic interstitium of the renal medulla, water flows freely out of the descending limb by osmosis until the tonicity of the filtrate and interstitium equilibrate. Longer descending limbs allow more time for water to flow out of the filtrate, so longer limbs make the filtrate more hypertonic than shorter limbs. * ascending limb Unlike the descending limb, the ascending limb of Henle's loop is impermeable to water, a critical feature of the countercurrent exchange mechanism employed by the loop. The ascending limb actively pumps sodium out of the filtrate, generating the hypertonic interstitium that drives countercurrent exchange. In passing through the ascending limb, the filtrate grows hypotonic since it has lost much of its sodium content. This hypotonic filtrate is passed to the distal convoluted tubule in the renal cortex. Distal convoluted tubule The distal convoluted tubule is not similar to the proximal convoluted tubule in structure and function. Cells lining the tubule have numerous mitochondria to produce enough energy (ATP) for active transport to take place. Much of the ion transport taking place in the distal convoluted tubule is regulated by the endocrine system. In the presence of parathyroid hormone, the distal convoluted tubule reabsorbs more calcium and excretes more phosphate. When aldosterone is present, more sodium is reabsorbed and more potassium excreted. Atrial natriuretic peptide causes the distal convoluted tubule to excrete more sodium. In addition, the tubule also secretes hydrogen and ammonium to regulate pH. After traveling the length of the distal convoluted tubule, only 3% of water remains, and the remaining salt content is negligible. Each distal convoluted tubule delivers its filtrate to a system of collecting ducts, the first segment of which is the connecting tubule. The collecting duct system begins in the renal cortex and extends deep into the medulla. As the urine travels down the collecting duct system, it passes by the medullary interstitium which has a high sodium concentration as a result of the loop of Henle's countercurrent multiplier system. Though the collecting duct is normally impermeable to water, it becomes permeable in the presence of antidiuretic hormone (ADH). As much as three-fourths of the water from urine can be reabsorbed as it leaves the collecting duct by osmosis. Thus the levels of ADH determine whether urine will be concentrated or diluted. Dehydration results in an increase in ADH, while water sufficiency results in low ADH allowing for diluted urine. Lower portions of the collecting duct are also permeable to urea, allowing some of it to enter the medulla of the kidney, thus maintaining its high ion concentration (which is very important for the nephron). Urine leaves the medullary collecting ducts through the renal papilla, emptying into the renal calyces, the renal pelvis, and finally into the bladder via the ureter. Because it has a different embryonic origin than the rest of the nephron (the collecting duct is from endoderm whereas the nephron is from mesoderm), the collecting duct is usually not considered a part of the full nephron. Juxtaglomerular cells are the site of renin synthesis and secretion and thus play a critical role in the renin-angiotensin system. 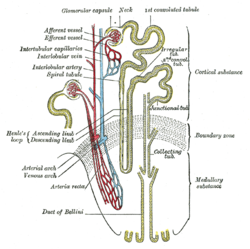 Distribution of blood vessels in cortex of kidney. Glomerulus is red; Bowman's capsule is green.